Job growth slowed and the unemployment rate ticked up but it’s still a decent report. The Bureau of Labor Statistics (BLS) released the Employment Situation report for July. The establishment survey showed payroll employment expanded by 209 thousand. The May and June figures were revised upward by a total of 15 thousand, bringing them to 229 thousand and 298 thousand, respectively. From the household survey, the unemployment rate rose to 6.2% from 6.1% in June, based on an increase of 329 thousand in the labor force that outpaced the increase of 131 thousand in employed persons. 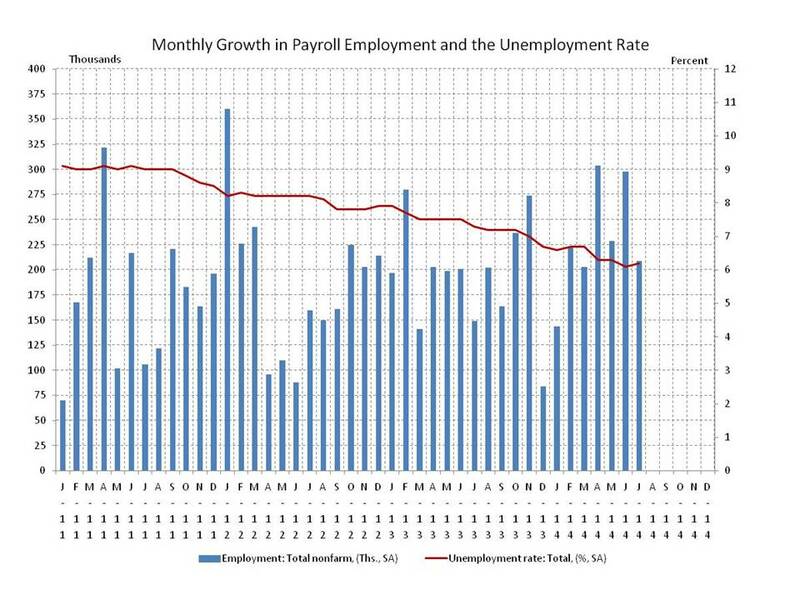 The slowdown in payroll employment has little impact on average monthly jobs gains which stand at 230 thousand in 2014 so far, compared to 194 thousand in 2013. The uptick in the unemployment rate is a positive signal reflecting an expansion of the labor force with strong gains in both new entrants and reentrants compared to recent history. Those are the positives. The negatives in this report are the still elevated levels of long term unemployed, under-employed and discouraged workers; the indicators that Federal Reserve Chairwoman Janet Yellen and other officials have identified as signs of significant underutilization, or slack in the labor market. Overall this report represents the slow but steady progress necessary for the Fed to continue winding down its bond buying program, but also the continuing softness that will keep the Fed from raising interest rates anytime soon.